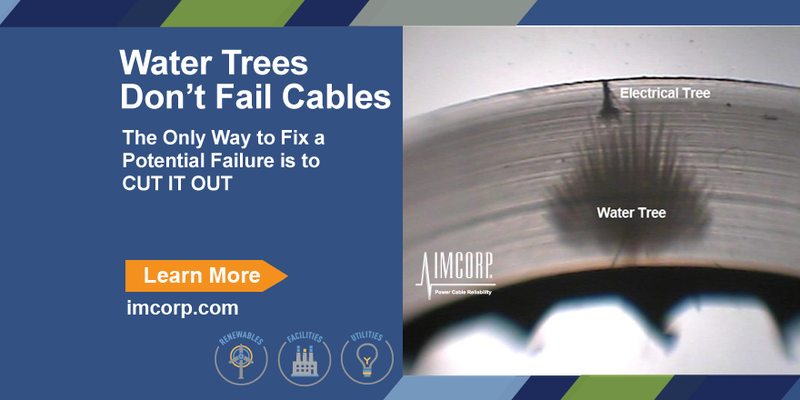 Decades ago we learned from many of the leading industry experts that water trees fail cable and we believed this industry myth until we collected cable performance data using the IMCORP Factory Grade® technology and discovered the truth. Based on our experience (footage counter), we found water trees are only part of the cable system failure story and they are highly unlikely to fail cable directly. Cable manufacturers' labs and our data agree that all significantly aged solid dielectric cables have water trees. This means there are billions of water trees present in billions of installed cable systems. Based on long term performance studies we know very few of these water trees will have (1) the ‘perfect storm’ conditions of sufficient localized electric stress to initiate an electrical (carbon) tree and (2) the operational stressors to drive the carbon tree (or incipent fault channel) to failure. The only water trees of concern are those that can initiate carbon trees. These are precisely the water trees the IMCORP Factory Grade® technology pinpoints and our analysis provides information necessary to assist our clients in removing them and ensure long term cable system reliability. The picture above shows a large water tree emanating from the conductor shield, with a carbon tree (darker root-like growth) initiated in the enhanced stress area between the water tree and the cable's outer semicon layer (removed in this picture). This carbon tree survived three years of service, annual field, and multiple laboratory, FactoryGrade® assessments without failure. Contact us to learn how IMCORP Factory Grade® technology can dramatically improve your cable reliability program.